Better late than never I guess. Now that I’ve had a couple days to digest how Sunday’s race at Hardwood went its time to sit down and write out this race report. As usual its not going to be some blow my blow account but focus on more of the major events. Hardwood was once again part of the Northern Cyclocross Series and one of my local races which meant I could ride to it. So had plenty of time to warm up during my 21 kilometer ride to the venue. Also racing there on Wednesday night’s meant I was pretty familiar with the course. Almost a home field advantage. Almost. But not really. Hardwood is probably one of my least favorite courses every year because of how tough it is. Lots of sand and elevation. And this year its like they had upped it a level with a big new run up and sand in every corner. Thankfully a wet week meant there were good ruts through the corners. Just had to stick your tire in and commit. Something about the start felt weird. I still lined up pretty close to the front, third or fourth row. They weren’t very clean rows. Learning from the previous weeks mistakes, I was planning to be a little more reserved with my start especially since that start at Hardwood went right up a hill. No point going way too deep and blowing up again. Which probably had me too relaxed, I wasn’t feeling ready to go and didn’t have the aggression to fight. Which meant I fell back pretty quickly on the first climb and was battling traffic through the first tight hairpin, over the barriers, and through the up-down zig-zag which had me running. It must be nice to be at the front of the race at the start. Maybe someday I’ll know that feeling. 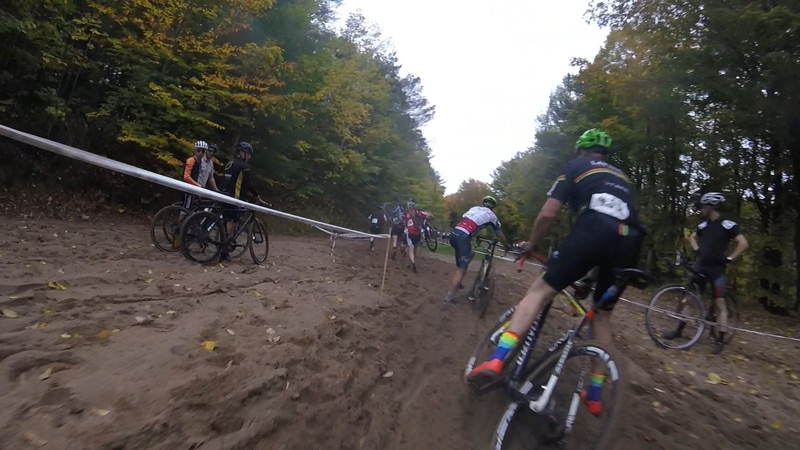 My biggest frustration about the race at Hardwood was I knew I could ride most of tougher features. I had previously cleared the volleyball court and uphill sand pits and I wanted to use that to my advantage in the race. But when you are near the back of the pack not everyone has those same technical skills. By the time I got to the sandy pits, I was either blocked by riders who were dismounting or any semblance of a rut had been obliterated by those who were running. But my ego meant I still tried every time and was usually forced into a slow, far from graceful dismount, loosing time and wasting energy. 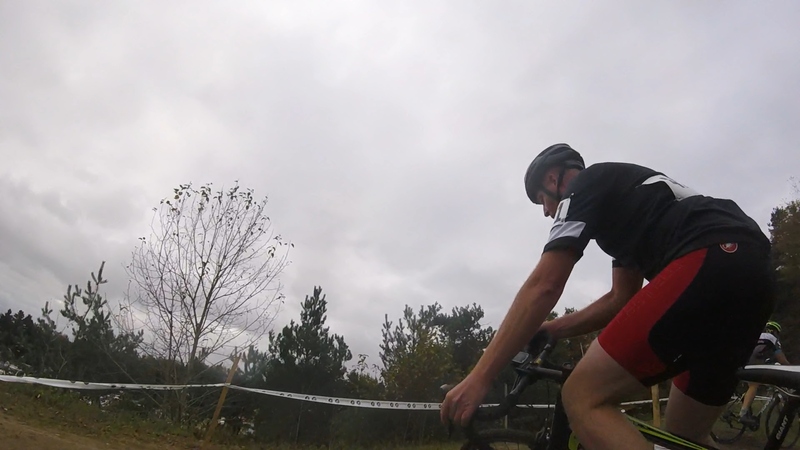 When I finally managed to ride the volleyball court on the final lap, I had an open run in to it and I used it to close a quite a big gap on the riders in front of me. 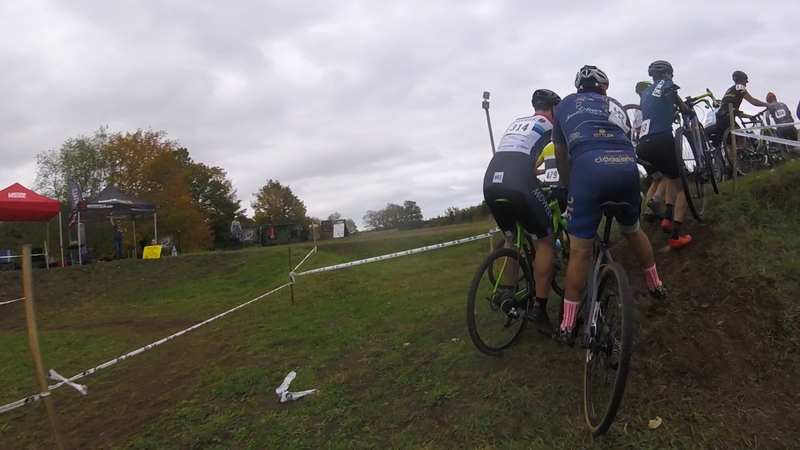 Speaking of less technically skilled riders, I found myself stuck behind one for the last bit of the first lap and the start of the second which ultimately resulted in him taking me down on the up-down zig-zag. I was going up the hill next time him as he stalled out and fell over right into me. I should have been able to get away from him sooner than I did but I did eventually drop him going into the run up. 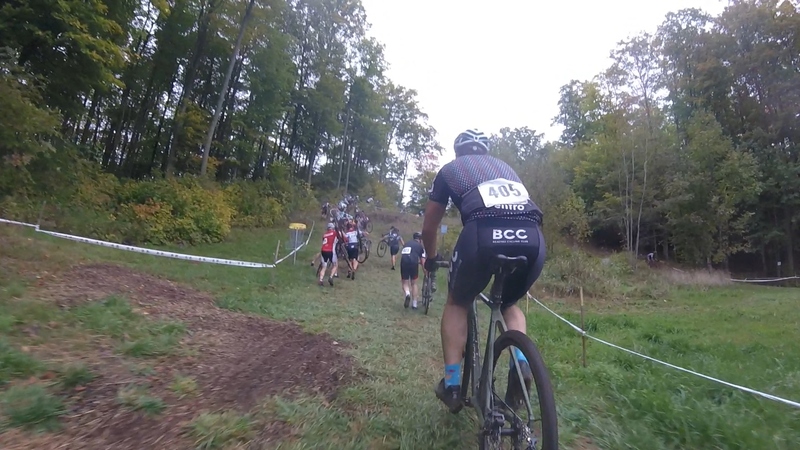 Overall, my race at Hardwood was flattered by the smaller field size. 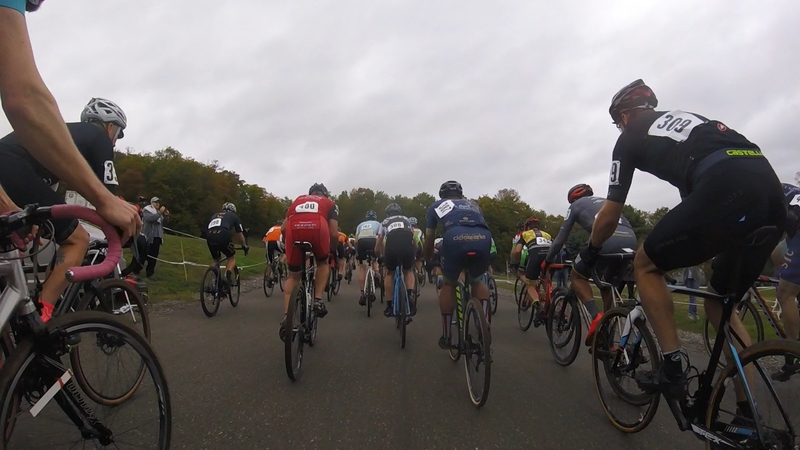 While we had about 120 starters in the E4/M3 race at the Cyclepath Cyclocross Classic, there was only 75 or so this time around. So instead of finishing in the 90s, I finished in the 50s which translated to a 19th in the E4 field. Top 20, I’ll take it. But better than any podium, I won a draw prize for a sick Kogel Bearings bottom bracket that retails for $160 USD. 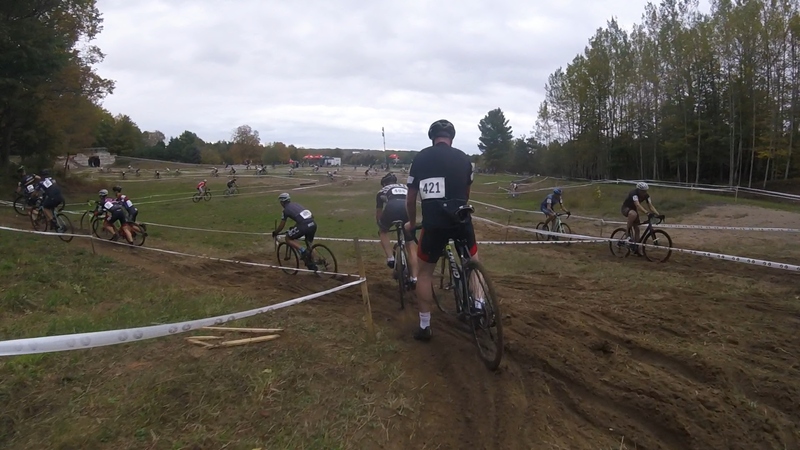 What I learned from the race at Hardwood is that my technique is far ahead of my bike handling and fitness. My technique is probably as good as anybody’s in that race but my bike handling and fitness put me in a spot where I can’t really take advantage of it. While building fitness is a long journey, I think there are a lot of gains to be made quickly with my bike handling, mostly building confidence. As I mentioned before, the wet weather had made the sand damp which in turn created big ruts through all the corners which you just needed to commit to to get around. Unfortunately, my lack of confidence meant I wasn’t fully committing to those ruts, losing speed and wasting energy. Or crashing. This coming weekend in the annual Baseball Cross which is put on by the Barrie Cycling Club. Another one local to me, its less than a 30 minute ride out to the course which is already up now. My plan is to spend as much time as possible on the course before Sunday building that bike handling confidence and dialing in the lines. Hopefully a good combination of technique and course knowledge will make up for fitness and propel me to a good result. Oh, and the forecast is calling for rain on Sunday!